If the focus isn’t on improving the experience for your customers, it stands to reason that the focus is on something else. When an organization is not putting their own customer’s first, then something is filling that void. When decisions are made, are they based on fitting the schedule or on the impact to your customer? Are projects teams centered more around functional specs than the ability to use those functions? Do project managers put their blinders on to coordinate the project timeline, or are taking a critical eye to understand the full journey your customer is on? Is the fallback plan to add more training documentation versus to fix the underlying difficulties? If this is your company, then it’s time for a change! To create a exceptional customer experience, and to have RAVING customers, start with the employee culture at your company. Grow “customer advocates” – those who can represent your customer in meetings and when decisions. are being made. Make it “fashionable” to be on the side of your customer – not a punishment. Base merit bonuses and increases on the success of your customers. Start at the top and make sure the CEO is the stakeholder of the customer’s welfare. In my book, Happy R.A.V.I.N.G. Customers!, “Chapter 3. 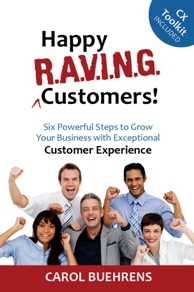 R = Reality Check” focuses on how you can identify the maturity of customer experience at your company. “Chapter 5. V = Vote to Change” takes a look at how you can take care of politics start achieving cultural change. “Chapter 7. N = Note Success” draws a direct line to rewarding employees for doing the right thing – acting on behalf of your customers.